A few months back I had my life changed forever-more when I visited a restaurant in Wilmington, North Carolina called Sweet & Savory. The restaurant combines French style cooking with American style foods, and southern cuisine. 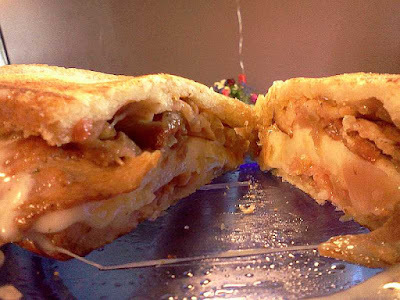 One of the most highly recommend sandwiches is their Ultimate Grilled Cheese made of Havarti, bacon and tomato. It is amazing, however, considering I don't typically get to the coast all that often, I decided, eventually to make my own. Uh Oh, SpaghettiOs are French. There's a sci-fi show I watch, where in, one episode, the alien race slowly turns the human into one their species by slowly poisoning the human. By the time the character realizes, he sheds his earthly form and morphs into an alien. Likewise, Americans tend to frightened of the French. May the French forgive me for the comparison, because I'd gladly trade places with any of you, any day. That said, we all remember the recent "Freedom Fry" rebellion where Americans refused to eat anything with the word "French" in it. 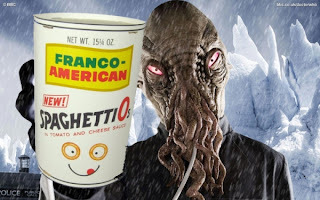 So wouldn't it surprise most of those individuals who hold a bit of franco-phobia, to know SpaghettiO's, the child (and adult) pasta dish in a can, has it's roots in France.